I snapped this cute little bunny enjoying an afternoon snack outside the Lopez Islander Marina during our visit last month. Rabbits are everywhere in the San Juan Islands today even though they are a favorite attraction for the tourists the critters aren’t native to the area and are seen as pests by the local farmers. The first rabbits were brought to Smith Island around 1900 by a light house keeper hoping to supplement his income with meat sales to the Seattle area but when the next keeper arrived he wasn’t interested in keeping up the small business and let them roam free. No one is sure how they traveled between islands but today they can be seen wherever grass and food are available. Posted as part of Lens and Pen by Sally’s Phoneography and Non-SLR Digital Devices Photo Challenge: Animals. Good catch of the day. Animals are cute in small numbers, When they multiple, they are considered as pesky. There was a problem at University of Victoria one time and I saw plenty running around. I don’t know how they controlled the population. We probably don’t want to know how they controlled the population, Perpetua… it’s a constant debate in the Islands too but so far they have decided to let them be. I guess if I am not a gardener I would enjoy watching them. But since I am, I don’t want them there. Geraniums are a year-round favorite of mine. I keep them inside during the cooler months. Happy Photo Challenge. So cute! What a cool capture, Lisa. Kinda like squirrels and rats, the fluffy tail cute. The other, where’s the trap? A bunny ran across my path on my walk earlier. 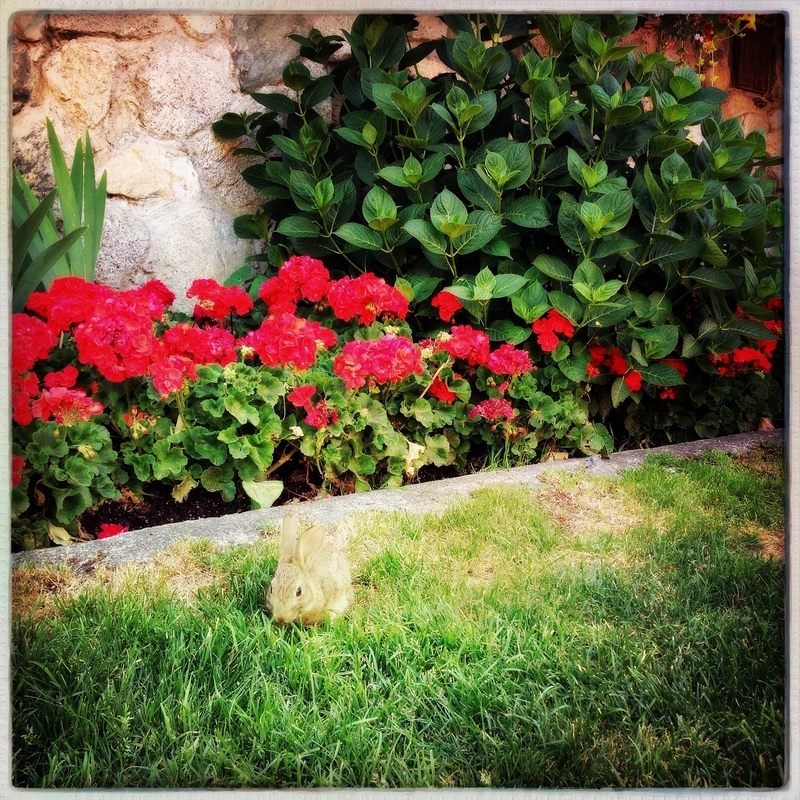 Beautiful garden and sweet bunny. A homesick Englishman introduced them to Australia in the nineteen hundreds – a very bad idea! But they are very, very cute. We saw a couple of little baby bunnies on the lawn of a Court building right in the middle of Canberra (national capital) a few months ago. I didn’t have my camera handy, unfortunately! I think they wanted to eat them, rather than enjoy their cuteness…Lots of hard-up country people only survived in the ’30’s thanks to the thousands of rabbits, so maybe we should be a little bit grateful! Our tiny town used to be famous for it’s annual rabbit skinning competition, but all the experts grew up in the ’30’s and they are all gone now. Yes, they’re so cute until they start eating all your veggies and flowers. 😦 But a lovely, color-filled photo, Lisa.